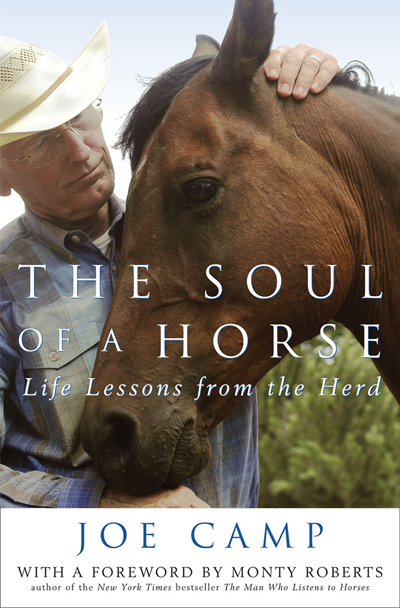 You might remember that, for me, the most important element in Monty Roberts’ Join Up is that the choice to join up, to trust, belongs to the horse. It is not forced by the human. And when the horse makes that choice freely, of its own free will, everything changes. No-Agenda Time takes longer than Monty’s Join Up (which usually works for him in 30 to 40 minutes). Our No Agenda experiment with our mustang Saffron took 35 days, but when it happened everything changed, like a flash, right before our eyes. Everything! As if she had just flicked a switch. When we adopted her she had never willingly touched or been touched by any human. She would eat hay near my feet so long as I was sitting down, but if I stood up she was gone. And if I dared to attempt to touch her she was gone. And she came to us pregnant with a baby conceived in the wild. Before we picked her up we had already decided to do absolutely nothing with her until, by her own choice, she had accepted us. Until she had told us very clearly that she trusted us. We began No Agenda Time on her second evening here. 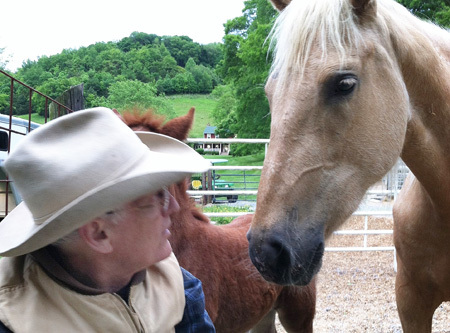 We chose No Agenda Time because I believe that the more fearful the horse, or the more abused the horse has been in the past, and/or the less experienced the owners (us), the better it is to have less contact and thereby less chance to make a mistake. Also I’m lazy and No Agenda Time is definitely the lazy person’s Join Up. 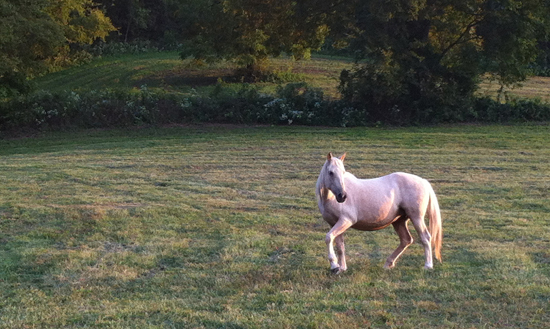 Had we introduced our first mustang, Noelle, to No Agenda Time right at the beginning and made no moves to attempt anything with her that could even possibly evoke a fear response until well after she had, of her own free will, committed to trust us, I believe things would’ve been very different with her. But No Agenda Time had not entered our imagination at that time. And I made mistakes with her that caused fear, lots of it, and cost us years. What we didn’t know then is that every fear of human is caused by a human. The current human, or some past human. Somewhere. At some time. And therefore can be associated with all humans. (See Born Wild – Chapter 29). 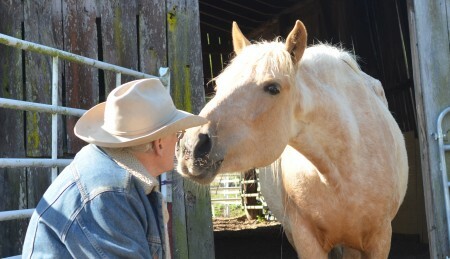 Have you ever wondered what it would be like to meet a horse who had never seen a human before? Never been roped and jerked and pulled around by one. Never been physically forced to do things it didn’t want to do. Or was afraid to do. Never been frightened out of its wits by a human. Or chased by screeching men on other horses. Or poked, kicked, and whipped. Or electric shocked into submission. And she set out to find such a horse. That is simply the best lesson ever! Do not ever do anything that could cause your horse to be afraid of you. Unfortunately we didn’t understand this when our Noelle arrived. Still she taught us a huge lesson. She taught us about No Agenda Time. We just didn’t realize it at the moment. Without the history with Noelle, exactly as it happened, Saffron would never have experienced No Agenda Time. Nor would she be where she is today. 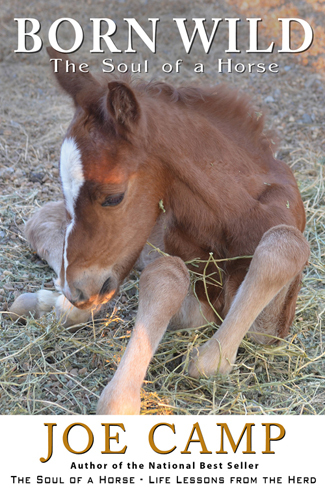 Firestorm was born three days after Saffron arrived and we were already doing No Agenda Time. Every evening we sat in folding chairs in the paddock with mama and her new baby… and completely ignored mama. There was always a great deal of contact and imprinting going on with the baby, but no contact with mama at all. We placed hay close to our chairs and Saffron would munch it with very few apparent worries. I believe that No Agenda Time is best accomplished sitting down, for several reasons. You are less threatening seated than you are when standing. Staying seated naturally restricts your mobility, thus your activity. The less you move around, the less threatening you are. And the less mobile you are the better the chance that you will not look at the horse, or attempt to touch the horse. 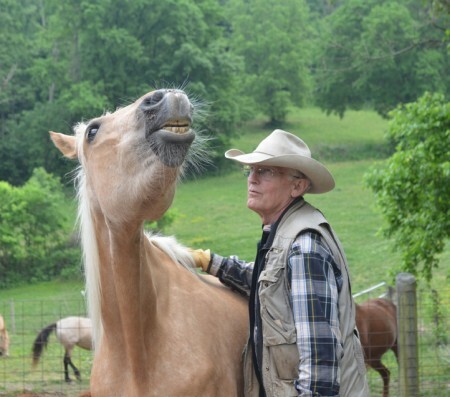 Placing good hay nearby, hay that the horse really likes, causes the horse to draw closer than she might otherwise do, and the closer she is with nothing bad happening, the more she will relax and begin to believe that you are a safe haven. 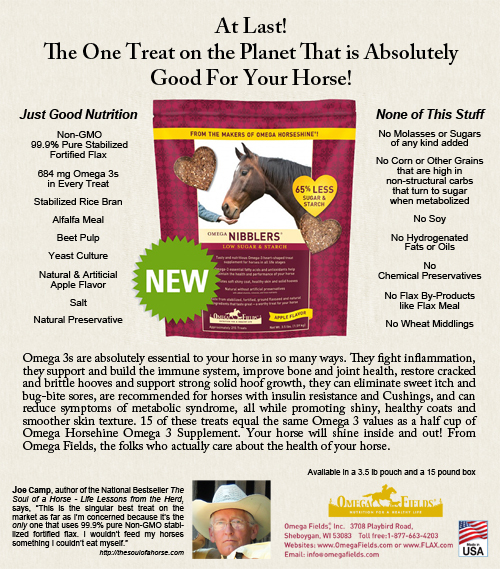 We do not use alfalfa in our regular feeding regimen because, in quantity, it is not good for any horse. But they love it and it’s different than their regular grass hay so we use it in small quantities for occasional treats, like a condiment, or as an enticement in an emergency when we need a horse to move somewhere quickly, and we use it in No Agenda Time. With Saffron we started the alfalfa placed maybe six feet away from us. When she got comfortable with that we’d creep it closer, to maybe five feet away. Then over time we’d move it even closer until it was eventually only a couple of feet away. All the while completely ignoring her, showing her no interest and making no contact whatsoever. She grew more and more comfortable. No Agenda Time can be accomplished with only one person and a good book, maybe ear buds and some good music, or maybe doing homework… but I definitely prefer it with two people in conversation. That seems to emphasize the fact that the horse is being ignored. Left out. It’s one thing to be buried in a book and quite another to be chatting, laughing, and not even trying to include the horse, and I believe at some level that resonates. It might sound weird but I believe the horse reaches a point of wanting to be included. And, too, Kathleen and I are our own best friends and we really enjoy being down in the paddock with a couple of small jelly jars of wine catching up on each others’ day. No Agenda Time proved to be one of the very best things that could’ve happened to our relationship with Saffron. On various occasions, she reached up and sniffed both of my knees… and my gloves… and more than once asked for a breath exchange. I sniffed back but understood that she was just exploring. It’s important to know that there was nothing in that desire to sniff that said I’m ready to trust you forever. She had not yet made that choice. She was working her way in the right direction, but only building through baby steps. I made no attempt to engage her in any way and merely continued my conversation with Kathleen. In other words I was leaving it completely up to her. Rather than make a mistake I chose to make no move whatsoever until she almost literally grabbed me by the shoulders and screeched Okay, already!!! I’m in!!! In other words, please do not jump the gun. Make your horse say it loud and clear. There was a time, not too long ago, when I could not have resisted trying to push the envelope. Reaching out, trying to touch her. Forcing myself on her. But I sat on my hands, figuratively speaking. Because the moment of Join Up had not yet occurred. I know I tend to say some things over and over but this is so important. Relationship First continues to be the key. And the relationship is not set until the horse makes the choice, of her own free will, to say I trust you to be my leader. And that’s when everything changes for the better. How long will No Agenda Time take? When we started with Saffron we committed to take whatever time it takes. And, for it to work, you must make that kind of commitment. The horse, its history, you, the paddock all are involved in how long it takes. I know friends who have accomplished this type of Join Up in a month by just sitting alone in the middle of a pen, studying for college classes. Once a day, maybe an hour a day. And then there’s our Noelle who has already taken much longer than a month, but she has so much to overcome, and she is making progress. On a recent evening it was all was quiet and nice until Noelle caught the rim of the tub with her lip and it lifted maybe two inches off the ground. Before the sound of the tub’s plop back onto the pea gravel had dissipated Noelle was halfway across the pen. We hope we can recapture what we had with her before the move to Tennessee, and take it further. But it will be on her time, not ours. By her choice, not ours. Meanwhile we are thanking God daily for Saffron. And Miss Firestorm. And that very special surprise on the evening of my birthday. Day #35. We settled into our chairs in the paddock in front of the barn for our ritual No Agenda Time. Baby Stormy, now one day shy of a month old, came right up for a rub and a sniff and promptly dropped onto Kathleen’s feet for a nap. That, too, was becoming ritual. Miss Saffron was munching hay near our feet, appearing even less concerned than usual about being close to us. I was doing my best to ignore her, which, remember, is what No Agenda Time is all about. But every once in a while, when she would get really close, I’d use that as an excuse to break the rule. “You know the rules,” Kathleen would say. Two fingers onto her cheek for little more than a second was the best I had ever done. Only once. If pressed, she would walk away. If I stood up she would walk away. 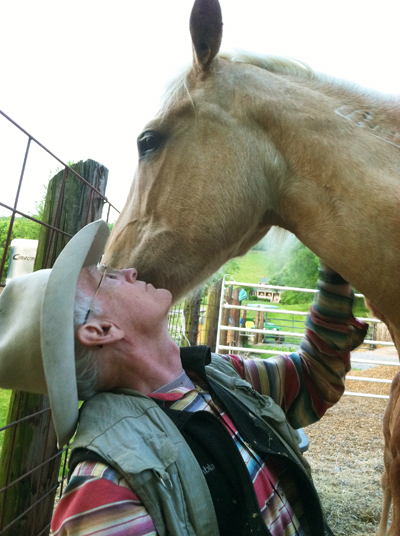 We usually use Monty Roberts’ Join Up to begin relationship. But the good things that occurred when we spent this sort of time with Noelle after her Malachi’s death encouraged us to try it with Miss Saffron. We’d been at it for a month, sitting in the same place every night, since the day Stormy was born, which was three days after Saffron arrived; and we had promised ourselves that once started we would pay no attention to time. We would take whatever time it took. We hadn’t been sitting long on this birthday evening when there was a crunch behind me on the pea gravel covering the paddock. A close crunch. I glanced up at Kathleen. My hand began to sneak up her face to the top of her head, sliding over to scratch the base of her ear. A thumb slid inside and rubbed and rubbed. Miss Saffron purred. I didn’t know what to think. 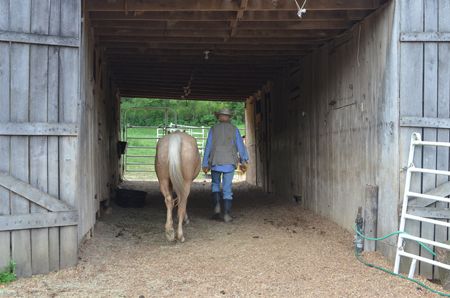 The best progress I had ever had with any of our horses was incremental. A little at a time. Even now, four years after Noelle came to us, I could barely touch her ears. And only then on some days. I wondered if I should attempt to stand up. My hand slid down her neck, rubbing and scratching as it went. I felt like a school kid on my first date, trying to sneak my hand onto her shoulder. I scratched back up her neck and eased into a standing position as I went. Saffy took no notice. Suddenly I hit a sweet spot and she responded in ecstasy, stretching, reaching for the sky. I scratched all the way down her back to her tail bone, slid down her hip, and underneath to her tummy and her belly button, then back forward, and down her front leg to her hoof. I was tempted to lift it, but probably chose wisely not to. This was enough for the moment. Leave it all positive. Dropping back into the chair I turned to Kathleen with my mouth gaping open. Saffy rested her chin on my shoulder and actually dozed off. That’s the day we discovered with Miss Saffron that negative marks on a slate from previous humans can be erased. Wiped clean. It just takes time. We allowed Saffron to take the time that she needed to clean her own slate and when she was done, like the wild horses Kelly Marks found in Namibia, she was able to experience trust without fear. Which is why we spent that 35 days doing absolutely nothing with Miss Saffron except to feed her, and be available. And, for 32 of those days, be sweet and loving to her new baby. How do you know which method to use? A traditional Monty Roberts Join Up? Pat Parelli’s method? Or No Agenda Time? I would say if you know that the horse has had some bad experiences with humans who came before you, I would use No Agenda Time. If you know the horse has had good experiences with previous humans and is familiar with halters, maybe even has been ridden, perhaps try the traditional Join Up. With any mustang – my opinion only – I would use No Agenda Time. Had we known when Noelle came to us what we know today, and had we used No Agenda Time back then, I believe things would be very different today. Try it. But let the horse make the choices. Don’t be an opportunist. Let it roll along like a family conversation and ultimately the horse will begin to feel very safe and trusting, and one day that switch will flick on and everything will be different. In an instant. And how terrific that feels. As I write this, we are back at it with Noelle. Take two. We will report. Oh, and once the relationship is in place, of the horse’s choice, once she has said I trust you to be my leader, then you must be a good leader. See Leadership Second.